You are here: Home » Tromboncino albenga for lunch anyone? Tromboncino albenga for lunch anyone? Encouraged by the decent summer last year I have been a bit more adventurous with some veg this year, although I decided against tomatoes outside because I felt the risk of blight was too high. The squashes all did well last year and with the new arches in place I thought I would give this unusual ‘courgette’ a try. I hedged my bets a bit and planted two of the 7 arches with four plants of ‘Tromboncino’ * and the rest with ornamental gourds. But so far I feel I was a bit too cautious because the ‘Tromboncino’ have done well and are already 2m high. Because these are Italian and apparently originally from Liguria I assumed they would need warmth so I sowed them a few weeks later than the other squashes, in May, and planted them out in early June. I made sure they did not go short of water when young and I did take off the first flowers to make sure they made some growth and didn’t just produce one fruit on a small plant. But now they are growing well I have left them to flower. 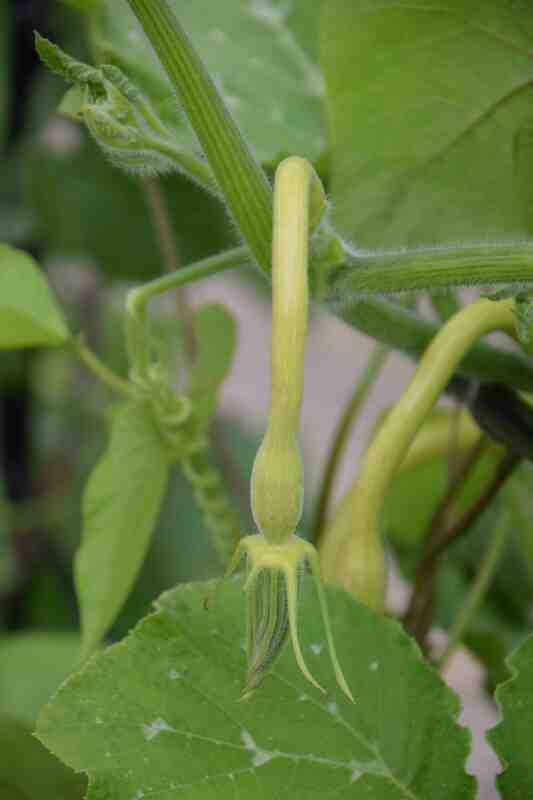 I intend to pick the first fruits when small so they can be used as courgettes and leave the fruits at the top of the plants to mature so they hang from the arches. When mature the fruits can reach 90cm. 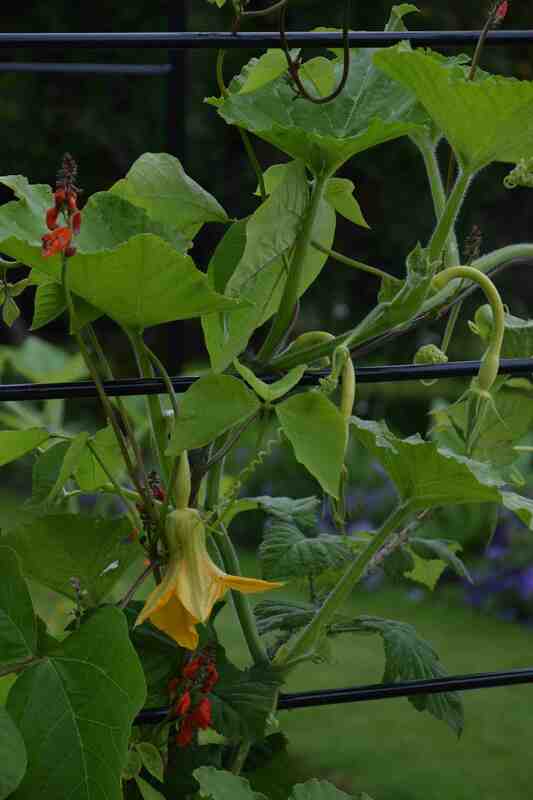 Unlike proper courgettes which are Cuburbita pepo, this one is a form of C. moschata which is the group that includes winter squash such as butternuts. I have eaten young butternuts and they have a denser flesh than courgettes. So although I have not picked one of these yet I expect the flesh to be more solid. As a winter squash it is supposed to be inferior to butternuts. Like butternuts the seeds are all in the bottom end so the long neck of the fruit is solid flesh, which will be useful. It is normally harvested when about 30cm long. Even without having picked a single fruit I am happy with the plant because it is growing well and the flowers are really big and attractive. Hopefully a later post will follow with a ridiculously large ‘trombone’ squash. Fingers crossed. Stop press! Since writing this I have now eaten the fruits in the photos. I ate them raw because they were small (about 20cm long) and I have to say that they were really nice. In fact I thought they tasted a bit like avocado. I will have to try them again but if they really do that is a huge bonus since they probably contain about 2 calories – unlike avocados! Not being a fan of courgettes, I had to take notice of your comment that they tasted like avocados. Now that’s a different thing altogether! If I could grow something tasting like avocado…… Please keep me posted! Will do! The cold nights of recent days have slowed growth but there are lots more growing so I will confirm my first thoughts soon.